I’ve been observing a patch of purple coneflowers in our backyard. The coneflowers themselves are both attractive and interesting. Some people believe that extracts from native coneflowers (a.k.a. 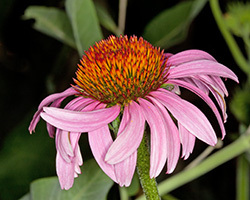 echinacea) help fight the common cold. The critters coneflowers attract are fascinating. 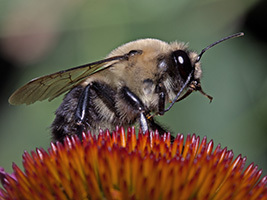 Bumble bees and honey bees are regular visitors. I see them almost every time I look in on the coneflower patch. 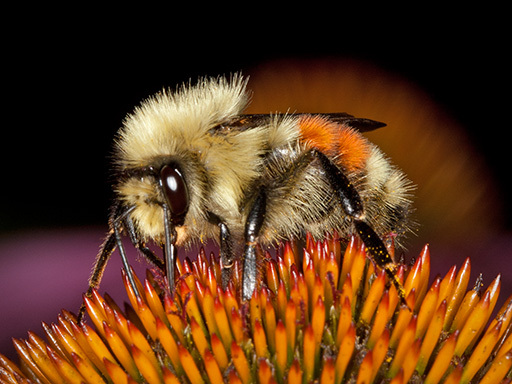 Bumble bees are North America’s only native social bees. 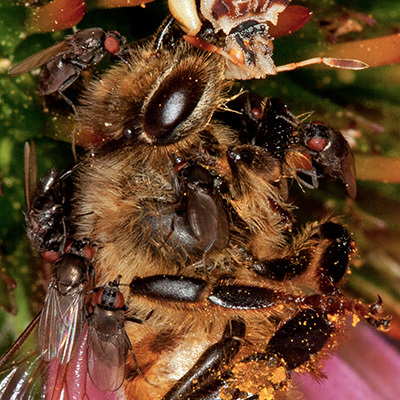 Honey bees are, of course, social as well, but they aren’t native. The first honey bees in North American were brought by European colonists in 1622. Even though they are also common, I still get excited when I find a tricolored bumble bee. The band of orange fuzz makes them special. Some sweat bees are even more colorful than tricolored bumble bees. 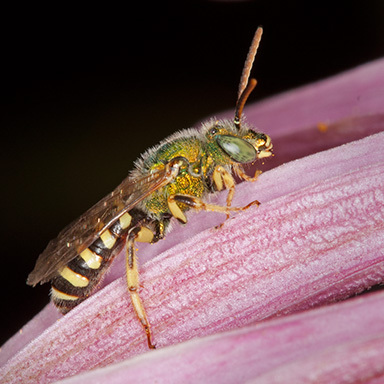 Although sweat bees are reputed to be attracted to human sweat, I’ve yet to be bothered by sweat bees while photographing in our coneflower patch. Maybe these small bees are too busy gathering pollen to notice that I sweat profusely while watching them fly from plant to plant under the hot summer sun. Or maybe my camera scares the sweat bees away. They seem much more easily startled by quick movements than bumble bees and honey bees. Only after repeated attempts was I able to get a sweat bee photo that I liked. 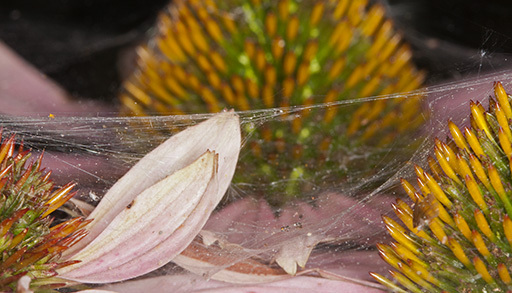 The coneflowers host predators as well. 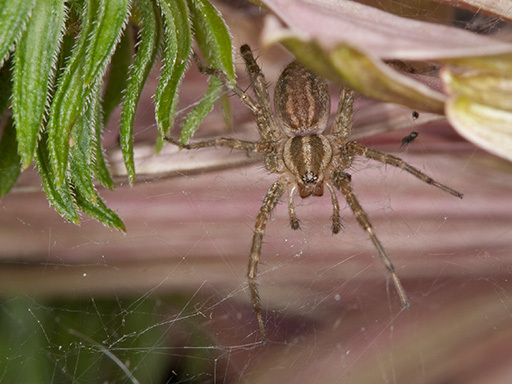 I found a spider web connecting three neighboring flowers. Hoping for a meal to come along, a spider waited beneath one of the three flowers connected by its web. While I watched, both a sweat bee and honey bee got stuck in the web. They flailed frantically before managing to escape. 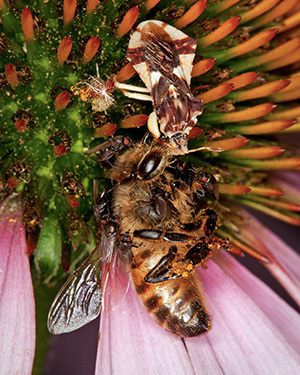 Another honey bee appeared to be the victim of a different predator. The insect at the top of the photo may be an assassin bug. If it is, it probably killed the honey bee. The half dozen flies on the bee’s corpse are probably flesh flies. The flies are difficult to see in this small photo. In fact, I didn’t notice them myself until I looked at full-sized version of the photo on my computer screen. In the detail I count four flies on the left side of the bee, one and possibly another on the right side, and one that’s difficult to pick out in the middle. 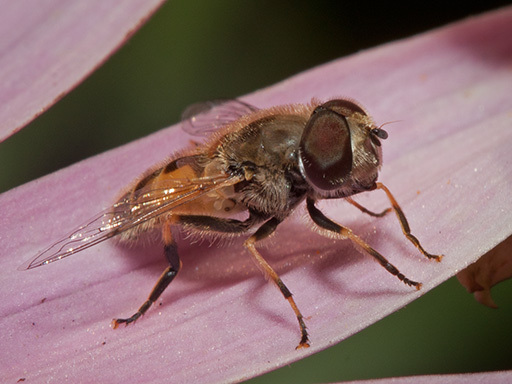 To find the flies, it helps to look for their prominent brick-red eyes. Flies on the dead bee weren’t the only flies in the coneflower patch. Bee flies are regular visitors. 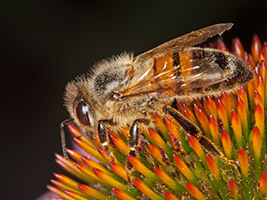 Bee flies look and behave much like bees, but, like other flies, they have only a single set of wings. Bee flies tend to hold their wings out while resting. On one occasion, a green bottle fly perched on a down-hanging coneflower petal. 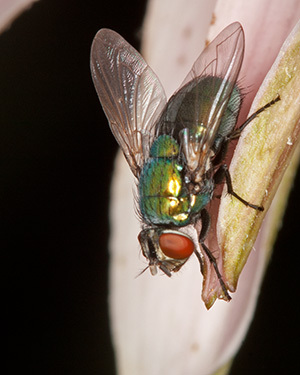 Bottle flies are attracted to decaying flesh, decomposing organic matter, and foul-smelling plants. I imagine this fly was a casual visitor not specifically attracted to the coneflowers. While I was watching, it perched on the petal grooming itself and didn’t go near any of the flower heads that attracted the bees. The petal was probably just a convenient place to land. One day a thread-waisted wasp came along and suspended itself from a coneflower leaf just long enough to have its picture taken. I imagine it was a casual visitor as well. Thread-wasted wasps seem to be more attracted to mint plants flowering nearby than they are to the coneflowers. Occasionally, Butterflies take apparently random routes among the flowers in our yard. They seem to have difficulty figuring our where to land. When they do land, butterflies usually don’t stay long. 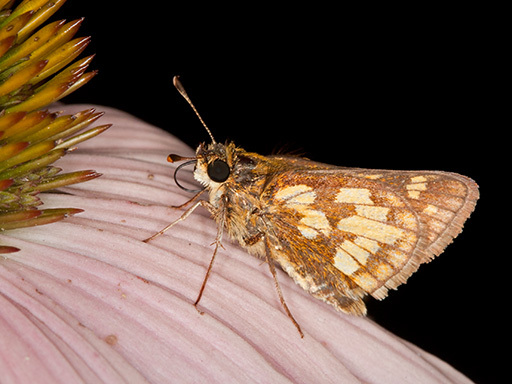 This Peck’s skipper was an exception. It landed on a nearby coneflower. I managed to get several photographs before it flew away. I’ve traveled thousands of miles to photograph wildlife. I’m delighted to have found such a rich source of new things to photograph just a few steps from our backdoor. Copyright © 2011 Robert N. Stocker. All rights are reserved. Please contact us for additional information. 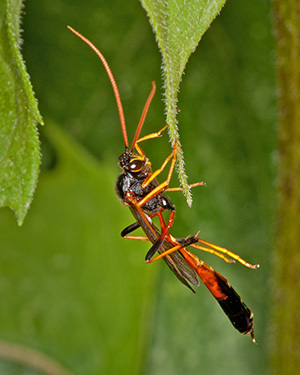 If you enjoyed this posting you may want to visit our small, but growing gallery of insect photos. We aren’t entomologists. Please contact us if you come across anything we have misidentified. This entry was posted in Nature by Bob Stocker. Bookmark the permalink.